Step 1. Paint a cardboard cone with shimmer paint and set aside to dry. Step 2. Fanfold lengths of paper stripping to make four legs. Glue the legs onto the body. Step 3. 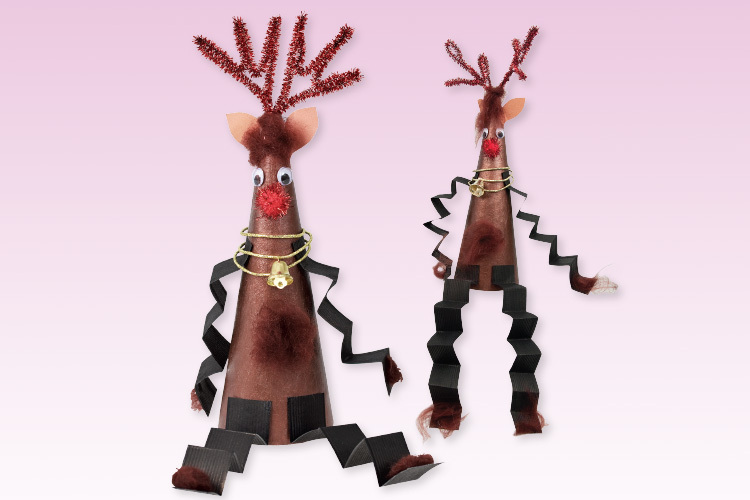 Use crafting combed wool to add tufts of fur to the reindeer’s belly, head and feet. Step 4. Wind metallic wire cord with true bells around the collar and glue this above the upper legs. Step 5. Glue joggle eyes and a glitter pom pom nose on to the face. Create some ears from brown cover paper. Step 6. Insert some tinsel stems into the top of the cone as antlers.